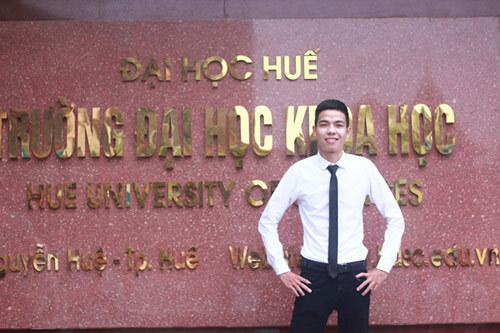 VietNamNet Bridge - Pham Nhu Ngoc Tuan, a student from the Hue City University of Science, has reaped big success in the information technology (IT) field. He has invented a tool to calculate GPA which is very useful for students. “My friends often asked me about a formula to calculate GPAs (grade point average). The school’s website doesn’t support the calculation. I also wanted to know my grade to strive for best results,” Tuan said. Tuan spent two weeks to write codes and a lot of time to test the tool before launching the tool in July 2016 at www.cnttk37d.com. Within two weeks, 2,000 students used the tool, saying it helped them save time. “It is so useful and friendly,” said Le Van Phuc, a student at Hue City University of Science. Pham Nhu Ngoc Tuan, a student from the Hue City University of Science, has reaped big success in the information technology (IT) field. To date, the tool has had nearly 20,000 submissions to the system and the figure is on the increase. The users of the tool are mostly students at Hue City University and its member schools. To use the tool, students need to log in on the school’s website, then download the Excel file to their computers. After that, they upload the files to the tool and wait for the results. The tool has been integrated into the school’s enrollment website. Tuan plans to also create a tool on Android for students’ use and launch a bank of exam questions used for the school in recent years for students’ easy check. Students don’t need to have accounts to use the website, because there would be a filtration unit and supervision from the administration. Tuan is also the author and administrator of many websites of different kinds, including e-commerce websites, news and forums that aim to serve the community. “I have set up a forum where people can raise questions and give answers about SEO (search engine optimization) and marketing. People now have the habit of searching on Google, but they cannot find suitable answers,” he said, adding that the forum is now six years old. Tuan is leading a busy life. He said he goes to school in the morning and works in the afternoon to cover his basic needs and review lessons in the evening.